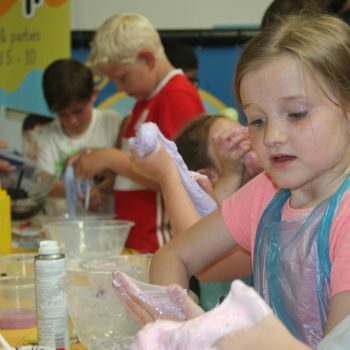 This biggest and the best slime making parties, workshops and events suitable for children from 5 years old, through to teens, and even adults! My girls had the best time…they haven’t stopped asking if we can go again! The slime they made lasted for weeks! 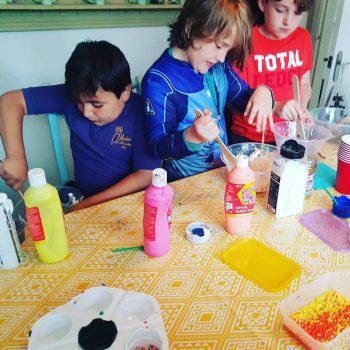 Wow what a fab slime making party – my daughter and her friends loved it! From my 8 year old – it was the best party ever! Amazing from start to finish. I’m sure they will be talking about it when they go back to school. 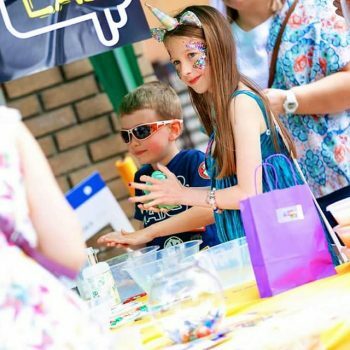 Our very own team of mad slime scientists deliver sell-out workshops across the UK, where kids aged 5-10 years old spend 90 fun-filled minutes creating two slime pots, experiment with slime handing, join slime stretching competitions and hang out with some new pals! 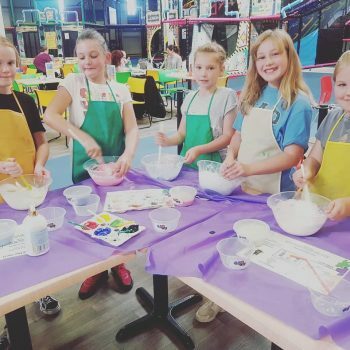 Give them the ultimate birthday party, and wow guests with up to 90 minutes of birthday awesomeness including slime making, games and even slime cake! Guests get to take home their slime, and the birthday child will receives a Slime Lab t-shirt. Please complete the form and we will be in touch to confirm your booking as soon as possible. As our parties are extremely popular, it’s best not to book a venue or send out invitations until you have spoken to us and we have confirmed availability. From Brownies to hen parties, Slime Lab is fast becoming the most sought-after private party provider. With our hosts able to cater for a variety of ages and needs, a private slime party is fun, educational, a little bit crazy, but most of all memorable! Please complete the form and we will be in touch to discuss your booking as soon as possible. Look out for Slime Express at your nearest local event. Children and adults love our £5 pop-up slime making lab, with the opportunity to buy their very own slime making kit to take home! Parents, don’t despair…white vinegar and water is the perfect slime remover for any accidental slime mess! LOOK OUT FOR UPCOMING SLIME EXPRESS DATES ON FACEBOOK! WANT A SNEAK PEAK INTO SLIME LAB..? IS THERE A SLIME LAB NEAR YOU? RUN YOUR OWN SLIME LAB! Be the first to bring Slime Lab to your local area! Access to help and support to run your business. 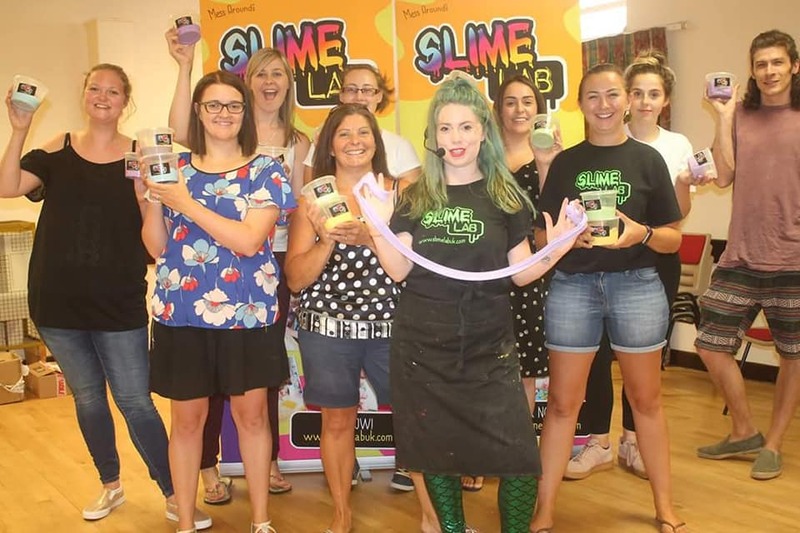 Find out more about how to become a Slime Lab UK franchise owner today! What postcode area are you interested in? How long is a workshop? What's included in a workshop? Is Slime Lab slime safe? I want to create memories; can I bring a camera? I've paid in advance; do I get a refund if I don't attend the workshop? Can I bring younger siblings with me? I have a party to plan; can you help? Children will have the opportunity to make two slimes, refreshments, learn tricks, win prizes and make new friends. Yes, the materials used in Slime Lab workshops are all sourced from trusted suppliers / high street retailers / well known supermarkets. And are provided in the knowledge that parents and carers supervise the children while they play with them. All the materials we use are non-toxic. We do not use borax. Yes your child(ren) remain your responsibility while at Slime Lab, workshops, events and parties and must be supervised at all times. Use your camera with caution; respect that other parents may not want their child in the picture, and please make sure it’s put away somewhere safe after use. It is advisable that both you and your child wear clothes that you won’t mind getting slimey in. If you or your child have long hair we advise that it’s tied back to avoid getting slime in your hair. Due to hire charges and costs of materials, I’m afraid we can’t offer a refund. Refunds will be issued if sessions are cancelled by Slime Lab UK due to unforeseen circumstances (unfortunately this does not include adverse weather conditions that prevent members from travelling to the sessions) and make up sessions are not possible. Slime Lab is suitable for children aged 5 years above. You are more than welcome to bring younger children with you but they must be supervised at all times and they cannot join in the workshop if they are under the age of 4. Slime Lab would be more than happy to fulfil the entertainment element of your child’s special day. Slime Lab Parties are fun and original and great value for money.